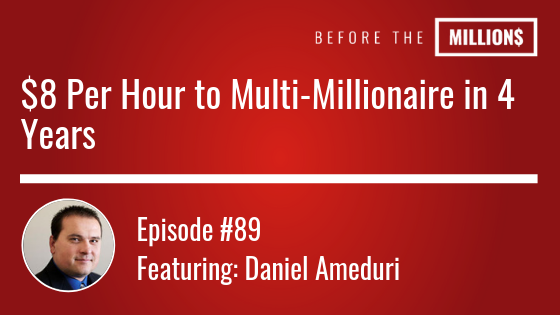 Daniel Ameduri is a self made multi-millionaire. After warning family and friends in 2007 about the coming market and mortgage collapse, he started his own YouTube channel, which has received 10 million video views. Even with a great calculation of the crash he failed through it and shortly after began to pick up the pieces as well as a special focus and passion for personal finance, he re-built his wealth and declared financial independence in 2012. Having no mortgage and enough rental properties to pay for his life style, he was able to build his business larger than he could have ever imagined. On today’s episode we discuss the importance of personal finance and self help. The major influences in Daniels life had opposing viewpoints, Robert Kiyosaki and Dave Ramsey partly cultivated Daniels business and his interest in investments. One really fascinating thing about daniel story is how terrible his credit is (below 500) and how he doesn’t let it stop him from being an investor to be reckoned with.